To answer the most pressing question, no, there were no Oompa-Loompas. 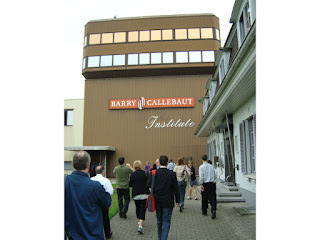 As a part of the European Union Center 2012 Summer Study Tour to Belgium and Luxembourg, the tour participants toured the Barry Callebaut chocolate factory in Wieze, Belgium. Barry Callebaut is an industrial chocolate producer, which means that they supply companies with liquid base chocolate, or other bulk chocolate products. Those products are then used by so-called “artisan” chocolatiers or companies which coat their products, such as cookies, baked goods, etc., in the Barry Callebaut chocolate base. 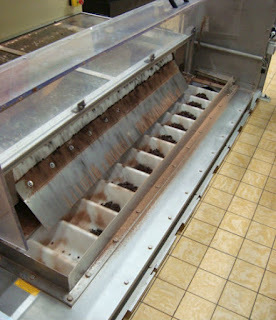 The Barry Callebaut chocolate factory’s whirling belts, robots, kettles, tanks, etc. fascinate most outsiders who tour the facility. What is truly fascinating, however, is how an industrial food company based in Europe can prosper and thrive. 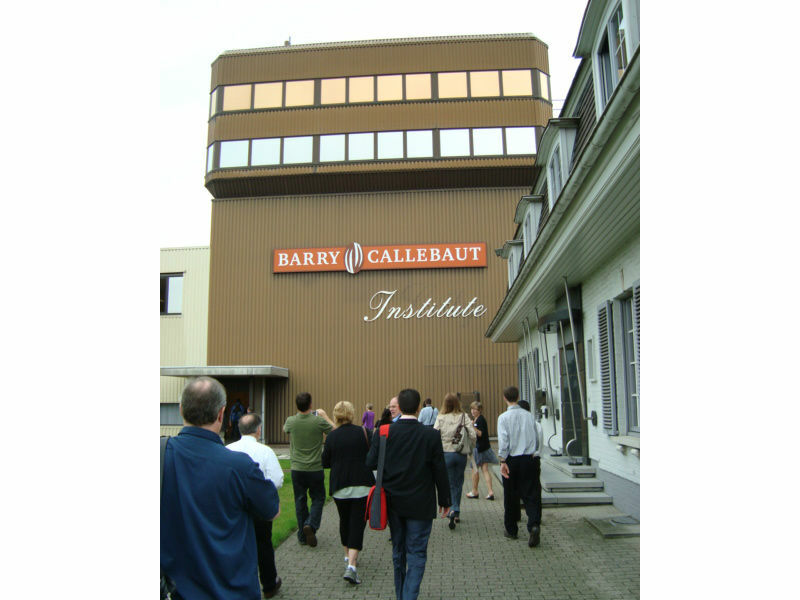 Barry Callebaut is currently the largest chocolate producer on the planet, producing somewhere between 20 and 30 percent of the world’s chocolate, depending on your figures. Belgium is part of the European Union, which has numerous restrictions on food production, imports, and various input costs for Barry Callebaut chocolate among other producers. The European Union legislation on cocoa and chocolate products alone is 5 pages long and lists numerous restrictions (e.g. a praline must not have less than 25% of its weight as chocolate) and names the nine different types of chocolate designated by the EU. Naturally, it is difficult to understand how a firm can continue to be the world’s largest producer of chocolate in an economically restrictive environment. From an American free-market perspective, any restriction raises input costs for a company, and causes an inefficiency. Thus, it would seem that Barry Callebaut chocolate faces significant disadvantages against a global market full of competitors with fewer restrictions. According to the Barry Callebaut representative who briefed us before our tour of the chocolate factory, Belgian chocolate is not an entirely domestic product. In fact, while most people think of chocolate as a German, Swiss, or Belgian product, the basis for chocolate or the cocoa bean, is a New World native. The cocoa bean was only introduced after the first Transatlantic trade introduced by Columbus and other explorers. Today, the cocoa bean is native to Western Africa, specifically Ghana and the Ivory Coast. Barry Callebaut, therefore must face the scrutiny of high import standards as they cannot successfully grow cocoa bean in an country which receives rain 200 days of the year. What Barry Callebaut lacks in sunshine, it makes up in amazing efficiency. The factory takes in fermented cocoa beans and then outputs liquid or dry final products. The cultivation, separation, and fermentation are processes which Barry Callebaut has its contracted farmers complete overseas, as those tasks require significant manual labor, a high cost in Europe. When the beans reach Belgium they go through a mostly mechanical process until they reach the last stage as a final product. Barry Callebaut has dealt with the European Union’s stringent standards in a way that increases their efficiency and increases their products’ quality. Because the company uses robots and other non-manual processes, their chocolate comes out pure and at the lowest cost possible. Some tour participants were shocked to see the packing bots operating at such quick speeds without any human assistance. In fact, someone asked, “What happened to the men who used to do this job?” Despite the reality of structural unemployment, Barry Callebaut has solved the problem of European Union regulation by investing into a nearly automated factory. Additionally, Barry Callebaut sacrifices the control of their final product to other firms who specialize in marketing, branding, etc. You won’t find their chocolate in shiny wrappers on the store shelves as its own product. This business strategy has won Barry Callebaut the world’s largest market share of chocolate and significant quality of product. James Garcia is a teacher at Champaign Centennial High School in Champaign, Illinois. He teaches AP European History and AP Macroeconomics, among other courses.